It seems like ages since I did a post. There is so much going on during the summer months that I almost forget I have a blog to maintain. So far I’ve done a little fishing, but haven’t really gotten into it yet. Now if I had a spot where I could catch “Basszilla” I’d be after him every day. 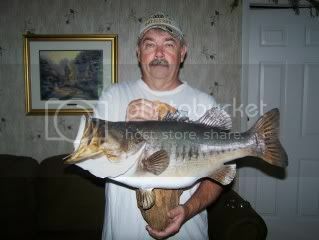 Fish, like the one in the picture, cannot be found in Michigan waters. Anyone who has ever landed a largemouth bass knows this one is big. I mean very big! I’ve fished Florida three times trying to land the elusive 10 pounder, to no avail. My son-in-law Tony fishes it one time and comes home with a 14 pounder. This is a fish of a lifetime, or maybe two lifetimes. He caught it on a big shiner using a balloon for a bobber. It only took him about 10 minutes to get him in the boat, and this fished dwarfed everything else that was caught that day. We were fishing catch and release, but Tony definitely wanted this one for the wall. It measured a little over 26 inches long and was the envy of everyone that got to see it. Hey a nice 5-6 pounder will get your heart thumpin here in Michigan. Just a little side note. I was drawn for a Michigan fall bear permit, but it was the third hunt. That’s a tough hunt, as the bear have been chased around for two weeks prior, and are really “spooky” by then. I may just wait till later in October to try and fool one into range. Got passed over on the elk permit again. That one will probably never happen. Gotta go cut the grass. 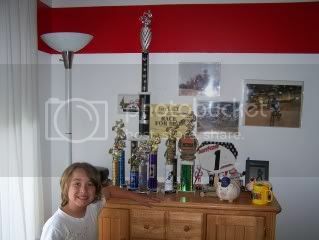 Grandson Logan Horwitz and some of the “hardware” he has collected in his short BMX career. He’s been riding less than a year, but it’s in his genes, as his dad Mark was a BMX racer when he was a kid. Logan raced indoors over the winter, and had only raced twice on an outdoor track, but the Rockford Nationals were going to be held only an hour and a half from his home. Mark figured it would be a good experience for him, and there are always a lot of vendors and professional racers present at these events. Mark bought and installed a gear for Logan’s bike, before the race, and with a friends help installed it on the bicycle. Login had to place at least 4th. in his second heat, or it was over for him. He did just that, and then placed 2nd in his semi final race. His forth race was in the finals where he placed fifth, just missing 4th. place. He received a nice trophy and certificate for his super finish. Not bad for only his third outdoor race. Some of the kids had several hundred races under there young helmets. We were all very proud of Logan. I didn’t get to actually go to Rockford (bladder infection) but I was able to pick up the whole race via satellite on the computer. I actually had a better view than Meghan, Mark, and Lorna. I was also able to tape each race for them to watch later. Way to go Logan! I’ve been visiting my daughter and her family in northern Chicago (Grays Lake) and have not felt all that well since arriving. The antibiotic has helped with the bladder infection, but now I have a cold. It is surprising how many deer are inside these suburbs. There has not been an evening when we haven’t seen deer while driving around. You can’t hunt in these areas, but population control is necessary. Illinois lets the DNR take care of the overpopulation problem by culling deer throughout the year according to my daughters neighbor. One of the biggest bucks I’ve ever seen was over here standing next to a busy highway. I would bet that most of these “monsters” die of old age, or meet their maker while trying to cross a highway during the rut. Grandson Login road in a National BMX event this past Saturday and did very well. This was only his third outdoor event this year and he made it all the way to the final round. Thats all I’m going to say about that, as I want to do a nice blog about it when I get back. We are catching the “Metra” at 7:00 o’clock this evening, and then getting on Amtrak in Chicago around 9:30. We’ll pull into Monroe around 3:00 a.m. if all goes well. We experienced a 1-1/2 hour delay coming here. I have yet to ride Amtrak without some sort of problem with delays, but then I know I’m in good hands, as the government runs Amtrak!!! 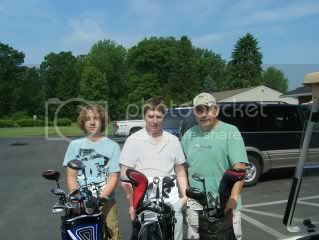 Grandson Quinn Russo, son Micah and myself at Deme Acres golf course. The three of us, along with my long time friend Ed Ponzy, set no records except for maybe loosing the most balls on a course! It was Micah’s first time out in many years, and he still shot a 102, which wasn’t that bad, all things considered. Quinn is on the school junior varsity golf team, but he was suffering from a severe bout with allergies, and could only muster a 104. Ed and I were in the mid-80’s which is ok with me, but Ed likes those 70’s to much to be happy with a mid-eighty. Hey it isn’t about the score anyway. It was just good being with family and friends as you enjoy the beautiful scenery of the golf course. And trust me we saw every inch of scenery this rural piece of land has to offer! The summer vacation season is upon us, and it gets harder and harder to sit at the computer and write stories. Personally, I will no doubt be backing off on the amount of post I do each week. In fact we are leaving for Chicago (by Amtrak) tomorrow, and will be gone 6 days. My grandson Login will be riding his BMX bike in a National Regional event next weekend, and we don’t want to miss it. I don’t know if I’ll be able to access a computer or not. An update on my deer hunting property. I planted two small food plots with turnips, and they are growing fast and furious. In fact the man I lease from sent me an e-mail a few days ago and said he was watching 9 bucks feeding around one of my tree stands next to a food plot. Boy does that get your blood pumping. October can’t come soon enough. As you may or may not know I recently completed a book about the life of my mentor and friend Joe Giarmo. Our local newspaper got wind of it, and reporter Jeff Meade interviewed me this past Sunday. Little did I know that they (The News) would run a front sports page article about Joe and my relationship, and about the book “Joe’s Story.” They have been passing around a copy of the book at the newspaper, and it has been very well received. 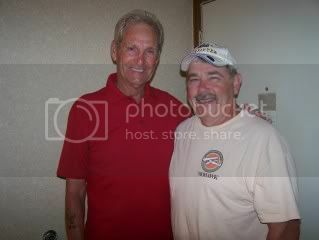 The above picture is of Bob Patterson and myself. Bob was one of Joe’s best boxers ever, and is somewhat of a local legend here in Monroe. I had met Bob before, when he was on the sheriff department, (no I didn’t get a ticket) and had seen him at a couple sporting events. In his early 40’s Bob fought in a couple toughman competitions, and was actually runner-up one year in the heavyweight division. He was fighting guys half his age, and put a “whipping” on most of them! Bob was, and is, one tough man. The day that this picture was taken, Bob and his lovely wife Faye were visiting Monroe from their home in Tennessee. They knew about the book, and I delivered one to their room at the Red Roof Inn. Joe talked about Bob a lot and loved him like a son. I felt as though I’ve known Bob for a long while, and what an honor to get my picture taken with him. Bob had played a round of golf that day with a few of his Monroe buddies, and shot an 86. If you know anything about golf, you know that 86 is a very respectable score. What makes it even more remarkable is that Bob is 72 years old, and has 22 “stints” in and around his heart. He still lives each day to the fullest, and believes when Jesus has his placed prepared, he will move on to the next phase of his glorious journey. Bob won title after title, once knocked out the number one middleweight in the world, and was written up by “Ring Magazine.” Many professional boxing promoters tried to sign him to a contract, but he would only do what Joe told him to do. Joe knew our local sheriff Bud Harrington and got Bob a job with the department. He served this community with dignity and honor, and never regretted not boxing as a professional. Now if Bob would only give me a golf lesson maybe I could shoot an 86! Ever since the big storm we had Sat. my computer has been going haywire. We lost power about 3:30 early Sunday morning and it wasn’t restored for almost 24 hours. Course you can’t blame Edison as they had over 200 power lines down just in Dundee. We live about 7 miles from where the 135 mile an hour tornado winds lifted back into the darkened clouds. We had very little damage around our place, but just a mile down the road trees were toppled and large branches were broken off. That damage was due to the 70 mile and hour straight winds. Actually the storm was moving so fast that it didn’t drop alot of rain here, but north of us they got drenched. Needless to say we didn’t get much sleep, as I was trying to locate my generator come daybreak. I had loaned it to my brother, and he hustled it over here bright and early. It’s a very small 1500 watt Champion, and would only run the sump pump and fridge. I’d run the fridge for 2 hours then switch over to the freezer in the garage, as I wasn’t about to loose my fish, turkey, and elk meat. My wife and I discovered one thing for sure – We rely on Thomas Edison more than we realize! We were both flicking light switches whenever we entered a darkened room, forgetting we had no power! Duh! Speaking of no power, we were ill prepared in the flashlight/battery department. My big D-cell flashlight was dead, and several of my double AA and triple AAA lights were also no help. Good thing I was able to locate my hunting flashlight, and my wife had some candles handy. We had to use the grill (salmon) to cook on Sunday, but we probably would of done that anyway. My garage door wouldn’t open, so we used my Explorer, rather than operate the door manually. When you see the devastation caused in Ohio and Dundee, you realize how blessed you are. We sure have nothing to complain about. Lives changed dramatically in just a few seconds. If your a praying person please lift up those whose lives have changed forever by these funnels of death and destruction. Especially remember the young school valedictorian (from Ohio) who lost her dad when he ran back upstairs to retrieve a flashlight, and was blown away. In closing let me ask if you have a plan for such an event? If you don’t you better come up with one. The basement is the safest place to be, but if you don’t have one you need to determine where the next safest place is. There isn’t much time to respond to such powerful forces of nature, so it’s best to have a plan in place rather than trying come up with one as 135-175 mile and hour winds bear down on you. Better safe than sorry! I can’t believe on May 30th. that my daughters pool water was 80 degrees! It has been many years since we have been able to enjoy the pool this early in the season. Seems like it may have been a fluke as the rains just keep heading our way. The place I lease in Hillsdale is still to wet for the farmer to plant his crops. They are way behind, but the fields are just to muddy. Anyway we had a great day in the pool. 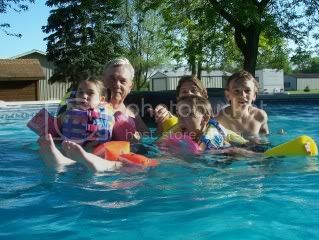 That’s McKenzie (3) Nadia (13) Quinn (15) and Keegan (9) having fun with “old” gramps in the water. McKenzie was so proud of herself swimming without anyone holding on to her. She was like a little water bug! We enjoyed the sunshine and blue sky along with the cookout. Son-in-law Tony and I had a moose steak that he got from his buddy Dale, who happens to own a place in Alaska. He shot the 50″ bull there last year. Family, food, and fun. It doesn’t get much better than that. 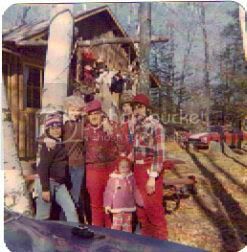 (The Norman Ansel family at deer camp 1974) Websters Dictionary defines a dream as, “A series of thoughts, images, or emotions occuring during sleep. My dad Norman Floyd Ansel died in March of 1978. That was 32 years ago! I have actually lived longer without my dad (32 yrs.) than with him (31 yrs.) To say I miss him would be a gross understatement, but every now and then he visits me. That’s right he comes and sees me. In fact he came last night, and we had a grand time together. I had just bought a nice log home with 17 river bottom acres that was full of deer. I had just finished walking the property when my dad came strolling down the long winding driveway toward my new home. I was excited about seeing him, and couldn’t wait to show him my new hunting grounds. I put my arm around him and as we walked toward the house I was pointing out deer runways that went right through my front yard. I told him about the river bottoms, and that I’d have a stand set up for him come fall. He looked the same as he did 32 years ago. I could even smell the aroma that was my dads “scent” if you will. Boy was it nice seeing him, and having such a great visit, even if it was only in a dream. I can’t explain these nocturnal visits, or the hows and whys of their happenings, but I embrace them as you would a loved one. Even though I have not laid eyes on “papa bear” for over three decades, I saw him crystal clear, heard his voice, smelled his smell, and embraced him tightly, just last night. These visits aren’t often enough, but oh how I love it when, for whatever reason, they are allowed to take place. Thank you God for allowing my dad to come see me last night. We had a lovely visit, and I wait in anticipation for our next encounter. Maybe then we’ll get to hunt from that new blind I’m going to make him. Love you dad.